-Can the bushel of tomatoes (I'm thinking salsa!) I got with my bulk food order last week, and put up the 1/2 bushel of sweet potatoes I got as well. I hope t can some beets from the garden also. -Start recycling some of my hubs old work uniforms into a crochet rag rug for our bedroom. -Use the $.25 pillow, and the $.99 blanket I found at the thrift store last week to make a dog bed out of an old kitchen drawer hubs took out when he installed my dishwasher. -rehang some old curtains in my bedroom to give it a mini makeover for fall. -hang as many loads of laundry as possible outside to avoid the dryer. I'm sure there's more, but I'll post that a different time I guess! Have a great frugal week ladies! Great finds! I love scores like that. We have been freezing too mostly Kale and Broccoli from the garden. Squash isn't ready yet but when it is I will be roasting it first and then freezing. 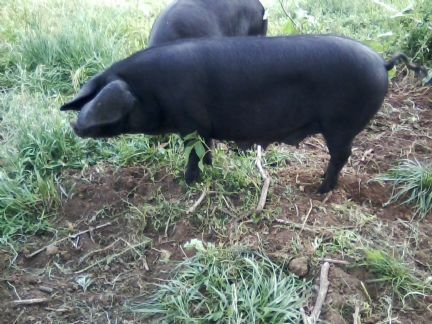 Here are a couple of pictures of Endeavour(our boar) and Trudy (our sow). We just love our LB's they are so sweet and docile. If you order any tell him Sharon from Colorado sent you :) We have been purchasing syrup from him for the past few years and his is wonderful! ~A local campground was selling some picnic tables for $25.00. Not in perfect shape but for the money and a little elbow grease they will be nice. ~Making my own breads, etc. ~A friend blessed us with some ripe tomatoes. I want to make some Chili Sauce but need to take it easy this week (dr's orders, a mild concussion) so I froze them until I could get to them. ~Another friend blessed with a variety of winter squash which will make a nice addition to our meals. ~I think we may get a frost soon so I picked half of the green tomatoes and will chop and freeze them for future use. ~Each year the garden is a learning experience for me :) I found this chart to help me plan better for next year. That along with taking notes each year will help save me money. ~I have been freezing Kale and Broccoli. ~I planted Red Orach this year and the seeds are ready to be saved. I am trying to do this with our garden to save money for next year. ~Planted some Broom Corn for the birds and for decorating so I picked some to display in an antique pitcher I have. ~Opened a brand new package of canning lids to find that one I could not use, it was bent in 2 places. I sent an e-mail to Ball/Kerr and they are sending me a coupon for a free box of lids. It pays to let companies know when something isn't up to par BUT I also let companies know when I am extremely pleased with their items too. ~I found 4 very nice placemats in a pretty Autumn Gold color for $2.00 at the Thrift Store. ~I use the water from blanching vegetables for the freezer to water our plants with. ~I made roasted Apple Sauce and saved the vanilla beans. I simply rinsed them and let them air dry. They will be added to our cast iron kettle on our woodstove for a nice simmering scent. I hope everyone is enjoying Autumn! Sharon, nice touch with a bit of heat in the sausages, we'll give that a try next time. Your pigs are outstanding! Hubby's on the hunt for some....LOL. We've not raise anything as rare as yours but Bershire & Tamworths have been good for us. Thanks for the Thanksgiving wishes. The harvest has been a loooong, cold, wet time so our Thanksgiving will include friends with a VERY lay back feel! I'm the turkey & pie lady & the rest is being cooked by the guys. Loving that!!!! As long as everyone is together that's what counts. LOVE your idea with vanilla beans....will give that a try! ..I've saved all the plastic fruit (blueberries etc)containers & stated decorating them for baking gifts during the holidays.......I THINK, not quite sure, Nini did that last year too. Quick question......since you've used the mince meat do you think the 3c of sugar could be cut down without changing the taste too much? I try to cut down on sugar if possible. STILL trying to get through all those green tomatoes. I have heard great things about Tamworths and Berkshires, are they pretty docile? Please show your quilt when you finish! ..swapped old barn wood for more straw bales, the guy even has to haul them! ..getting down to the last of the canning.....YIPPEE!!!! ..planted more garlic.....not one head made it this year, too cold......is garlic expensive to plant where you are?? It's crazy here! ..used up the last of some white paint we got at a farm auction....dirt cheap! Soooooo sad Our deal buying a jersey fell through! After 5 months of phone calls back & forth the guy backed out of the deal! The truck & trailer were ready to go! Nothing like leaving it to the LAST moment! Plus we're left with a steer that was supposed to be swapped for the heifer. No reason why just....NO! We think he must have found a better deal for himself. It's a little maddening but the hunt for one is back on. Would love to have one before snow hits! Really miss our 4 girls, ALL that fresh milk!!!!! ..Found pineapple on sale & it's drying right now. The house smells sooo good! ..only 7 trees left to replant..yippee! ..a friend gave me thread & a bag of odds for the pillow case dresses. anything helps! put new lining in sewing basket that I bought over 30 years ago at estate sale for no more than a $1 - funny how I can remember my finds from that long ago. I am so glad that you liked the Mincemeat recipe, it is a keeper in our home now and I plan on making a mincemeat pie for our Thanksgiving. I am not much of a salsa person by my honey is and he loves it, hope you like it too! Sorry to hear about the jersey deal falling through. I wish that people were more considerate. I hope you can find a better place for her. I love swapping and bartering too. I have been placing some items up on the barter board here and have also bartered my honey's soaps for things. What are dog baggies? Are they dog beds or quilts? I haven't tried planting garlic yet but I was just looking at some online because I really want to try planting. The price seems to be about $8-10.00 for 8 ounces so I don't know if that is expensive or not. I am getting down to our last bit of canning too. I want to try canning Cole Slaw (more pickled, not creamy) but after finding worms in our broccoli I'm not sure if I want to use our cabbage. I have a thing about worms, they just really turn me off big time. I bet the pineapple smells wonderful, I need to try that too! Where do you find the time to do all that you do Judy? You are so busy! Isn't it funny what we can remember? I am the same way, can tell you what time of year, the weather and what I was wearing when I found something :) Good for you drying goodies! I bet the lining came out beautiful! ~I pulled all of the green tomatoes off the vine and have been keeping some in the shed to ripen while canning and freezing the green ones. ~I was able to can some Chili Sauce yesterday. I have been wanting to try this forever but have never had enough ripe tomatoes. ~While going through the freezer I came upon some meat and vegetable scraps to make dog food with. ~Made some Gingerbread Dog Treats, they love them! ~My honey has been cutting dead trees down from our landlord's property (with his permission), today we will be working on that for more firewood. I think that we are going to have a very wet and cold winter. Saw the first caterpillar yesterday, the brown stripe was pretty wide, does anyone know what that means? ~Found a Hi-protein concentrate hog feed at the feed store so we are trying that. We won't need as much per meal. Our pigs are so spoiled, we mix their feed with water (sometimes whey or milk) so they have a cereal in the morning and evening along with foraging. ~One of the local nurseries has a clearance sale going on 75% off perennials, I am thinking about checking out what they have. I discovered e-pantry. For $20.00 and change I was able to purchase Mrs. Meyers Laundry Detergent, countertop spray and dish soap including shipping. You can schedule monthly deliveries and choose whatever products you want and when to have them delivered. This works for us because we really love Mrs. Meyers detergent, it is concentrated so it last us a long time but there isn't anyone local that sells it (that we know of). I should be getting our first order today and am looking forward to trying the cranberry scented dish soap, it will make cleaning fun! Everyone sounds like they're busy! Sharon, we adopted a wiener dog years old & have never been able to find a coat that she doesn't slip out of or plainly doesn't fit her big chest so I make her dog baggies. Izzy HATES to be cold (or too hot....this girl likes it just right! LOL) so the dog baggies were sewed up. Actually Izzy gave me the idea since she was sooo scared when she first came (she had been beaten & burned badly) she would hide where ever she could! If you drop a shopping bag she would be inside in no time, curled up & shivering. The baggies look like mini sleeping bag that Izzy has room to move around in & with the bottom & sides sewed tight we know she can't fall out. She feels safe! Everyone always laughs when she pokes her head out! Everyone here knows Izzy....LOL....she's the ONLY dog that's allowed to come into the auction building. OOOOH gross....I HATE broc & worms! No matter what we did we would have them. Have you tried soaking cut broc in salt water before processing? The worms die & will float in the water. Gives me willies just thinking about picking through it! LOL We used to powder with Rotenone (sp?) which is a natural product (comes from a flower) but we can't find it any more. It worked reasonable but you have to faithful with it. You're paying a bit more than we are for garlic. Hubby looked up the invoice. We bought 6#s for about $100, shipping included. 2 yrs old we had a beautiful garlic crop of 10 different kinds so put in 15 kinds last fall & with the super cold spring NOT one came up. We get down to -40F or colder here with lots of wind..we're thinking you're not that cold??? We're a zone 2(at the best), you're a zone 4????? Just guessing???? plus we're surrounded by water which drops the temp during the growing season. We planted SIBERIAN garlic due to the cold. It's a good around garlic & the taste isn't too strong! Stores good! We order from VESSEY'S in PEI. Sharon, when do you plant garlic in your area. Ours has been in the ground for 2 weeks but honestly we were a wee bit late. Yep, pigs & their milk feasts! LOL Their tails are held perfectly still while sucking it down! Too funny! Like the bread pudding idea. We wanted to swap FOR the jersey when it fell through but making calls already. Cross your fingers! Good deal on the waffle iron! I found a old one & when the eggs are piling up waffles go in the freezers. Fast suppers! Sharon, try to find the book "Pickled Pantry" by Andrea Chesman.....has GREAT & different cole slaw recipes. Good book for some different types of pickling for a change! What's in your chili sauce recipe? Sounds good! Today was the day!!!!!!!!!!! Doing a major happy dance!!!!!! The canning supplies were put away & waiting for next season! It's always a shock to find the price of a bottle of something you produced for next to nothing! Plus the best part....you know what's in it & where it came form! Great feeling to have it all tucked away! We're being told that food prices are going up 37% !!!! I buy by bulk as much as possible but that's even gone up! Meat is insane to buy!!!! We have some lambs & pigs to butcher but that's when the temp drop more. THANK YOU above for a good season! ..I grow fancy type sunflowers for florists so saved a lot of the seeds.....they're sooo expensive! ..going to a farm auction tomorrow....a day of catching up with friends!....plus NO work! YIPPEE!!!! Hoping to find some deals. The dog baggies for Izzy sound so cute! I bet she looks adorable with her head peaking out. Two of our dogs are rescue pups and are finally getting more comfortable here. Sorry I misunderstood about the Jersey! I hope things work out for you. I have never grown garlic before so I'm not sure when the right time is. Our daytime temps right now are in the 60's to 70's and night time temps down to 32 at the lowest. We are in zone 5b but for the past couple of years it has been colder so I'm thinking that our zone may have changed. I will check on that book too, thank you! The Chili Sauce recipe is in the Ball Blue Book and has tomatoes, red bell peppers, hot pepper, onions, vinegar, sugar and pickling spices. It is similar to Heinz Chili Sauce. You can add horseradish to make it a cocktail sauce. Congratulations on the end of canning season Judy!!! I love knowing what is in those jars too! I still want to can some soups, etc. for winter but as far as canning with garden produce, I am just about done. Time seems to fly by at this time of year! Sharon, we choose any sunflowers that don't have a lot of pollen that will drop & stain table cloths or whatever. I'll look up some of the names. A garden just isn't a garden without flowers of any kind! Thanks for the kind words about starting a blog but honestly I'm NOT computer smart....NOT even kind of smart!!!!!!! plus day to day on this farm isn't living a thrilling, exciting life! Come visit any time tea pot is on! ..The auction was held on behalf of a older family friend so we knew that the items were very clean so it turn out to be perfect for us! I finally have a better stove which thrills me to death!!!!!! I looked up the make & saved a whooping $518.67 off of new price! It was only 6 months old!!!! ..Bought a 1 year old couch & love seat. Paid $200 for both. No pets or smoke either. Yippee!!! Our stove, couch/chair will go into the next auction.....we've decided to donate the $ to the SPCA. The house looks like a furniture store until we can deliver these things! a box of ribbons for ribbon dolls...$1....Julie sent me one & they're so cute! ..a 4 chair/table patio set. I was looking at this set early this fall but they were sold out when I arrived, lucky for me! I paid 1/3 of the sale price! ..my best treasure was a All American 2 qt pressure canner!!!!!! I paid $30!!!! Be still my heart!!!! I've used the same brand canner for years but a qt size. I've collected 2 qt jars thinking that I'd love to make stews. I took a change on it with a gasket inside the lid cracked & the rocker gone but Monday I phoned the company & they will replace both parts! I can't believe the savings!!!! Came home with a smaller wallet size but a HAPPY camper! Can any one tell how much a new case (12) of half pts, pints & qts are down your way please? Jars have really gone up here! I rarely buy new ones but the half pts are hard to find used. Saved money on meat by butchering a steer this morning. We end the animal's life in the most humane way, out in the pasture. No stress from hauling it somewhere. Hanging in the freezer for 2 weeks then will wrap while the butcher cuts. Swapped 2 pigs for his services but we get the back bacon. Yippee! The rest of the day has been a WORK OUT.......started with 10 cords of wood to stack in the wood shed but now only 4 to go!!!!!!! We'll be saving $ during the winter on house fuel. Love the feel of wood heat plus the smell outside!!! Your weekend sounds just perfect! Isn't it nice to just relax with friends? Great deals at the auction! You go girl! I have heard wonderful things about the All-American Canner. I have a Presto one, still in the box. Michael is going to help me can with it this winter :) I can't believe how much wood you got done in one day, you must have been hurting. I love the smell of woodsmoke too. ~Making my own bread (as usual). Last week I made some Saffron & Raisin Bread and I've got French Bread rising now. ~I am roasting and freezing the Blue Hubbard Squash. ~Harvested more sage to bundle and hang for fire starters. ~At the local milling company we can get wheat hulls for free. We had heard about people feeding them to their pigs but ours didn't like them so much. I poured them in the garden and figured that they can ammend the soil. Well, the pigs decided to eat them. We will be checking the milling company more often. 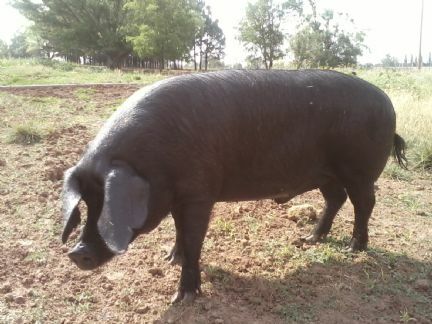 ~We have an order for one of our pigs for the end of December, this is exciting to us because it is our first time :) We also have someone who will be purchasing a half in March. ~Found out that with Michael's VA disability he is entitled to free registration on our vehicle, this helps so much! I can't thing of anything else, I need to organize the pantry now and take stock of what I need for this winter. I find it amazing that butter at the grocery store is $4.00/pound! Well, I get raw milk from a neighbor for $6.00 per gallon, make butter and yogurt every week . . . saving bunches on both! We don't drink much milk but we do consume butter and yogurt so it's nice to have FRESH milk to make it! Raw milk is SO GOOD CJ! It blows my mind that a gallon of gas/diesel is less than a pound of butter. I need to start making some more with the cream. The past couple of weeks have been busy. ~I was trying to figure out what I could use to can the large amounts of apple sauce and apple juice. I wanted the recipes to be uniform in flavor instead of having a couple of different batches. I was actually considering purchasing a very large pot when I remembered that I had a roaster in storage. I pulled that out, cleaned it and it worked great! ~I also made some apple, walnut and raising cookie dough, rolled into balls and flash froze so we could have some on hand if needed or when the mood strikes. ~I saved some scraps (no cores) and made applesauce to make dog treats with. ~The apples for the pigs saved us money on feed and made for some very happy piggies :) They also got most of the scraps. ~Baked my own breads and rolls. ~Went to the thrift store and found: a cashmere sweater, Eddie Bauer Blouse, and a Coldwater Creek top for .50 cents each. I also found some really neat vintage trims, cowhide gloves,wool roving in charcoal grey for crafting and spent $3.00 total on those items. ~Saved seeds from our Blue Hubbard Squash and Red Orach. If anyone would like some let me know, we have alot! ~ We weren't able to get the heritage turkeys for Thanksgiving so we just ended up purchasing store bought for .69 a pound. I also found some whole chickens for .88 cents a pound, which is cheap around here. ~Sugar prices dropped a little here so I am going to stock up on some as well as stocking up on flour before prices rise again. ~ Got a free subscription to a couple of magazines: Family Fun for a friend and Family Circle for my Mom, I also found a $6.00 subscription to Food Network magazine also for my Mom. ~Made some homemade Bouillon cubes for the freezer. These worked great and when I have more time I am going to cook down the stocks that I have in the freezer and make more room there. Most of my savings this week came from the grocery store. 2 whole chickens for .79lb - made bouillon, cornbread dressing with broth, next several days I will be using chicken in a lot of different ways & recipes. At that price Maggie, my little rat terrier, gets her share too. I didn't do it this week, but Sharon's post reminded me that I had used MaryJanesFarm Magazine offer to buy one subscription - get one free - to give my three sisters subscriptions and to renew mine own. 4 subscriptions for the price of 2 is quite a bargain. Just dropping by to see what you all have been up to... Impressed as always! This week, I made and canned chicken stock! I had a few gallon-sized freezer bags full of our CLEAN veggie scraps (peels, end pieces, etc. of carrots, celery, beets, onions, garlic, etc.) waiting to be used up, as well as a couple of bags containing chicken bones and scraps from previously roasted birds. Using soup socks (from Lehmans - SO awesome!) to contain everything, I divided everything between two large crock pots, added a little salt and let the magic happen. After the stock was done, I let it reduce a bit so it would be more concentrated. When all was said and done, I had canned six quarts of super hearty stock for soup (I have leftover chicken meat in the freezer and canned chicken on the shelves, and will add dehydrated veggies and rice or noodles as the mood strikes) and five pints for use in other recipes. Super satisfying! I've done all my Christmas shopping, too. I didn't buy a lot this year - I don't have to! I've taken up knitting again, so I'm making super-soft, warm wool scarves for the men in my life; I'm making special paper-crafted gifts for the women in my life (personalized clipboards, calendars which can be transformed to a year-long memory book, etc.) using items already on my crafting shelves; and I have saved plastic containers to decorate for home-baked goods for everyone (I'll add Victorian Christmas ephemera printed from my computer and embellish so they look all fancy and old-fashioned - super popular!). Jars of pickles and preserves will also be given. The gifts for the kids in our life were super easy to choose; the few things I purchased were bought on sale long before the holiday "sales" started to be advertised. <I really want to share that the "sales" that are going on right now, really don't seem to be sales at all... It's more like prices were jacked up before the holiday selling season and then marked down to lure buyers. Perhaps that won't be the case on Black Friday, but I would rather enjoy my holiday season rather than fight the crowds. To me, that's worth paying a little more in the summer, if that's even the case! ;)> I also plan to make little paper-crafted stockings for them, filled with homemade treats made especially to their liking. Our son's gift was a special purchase obtained through a special lottery-type sale from his favorite online store. He will be receiving a rather expensive brand-new dream gift with accessories, purchased for less than half the original cost! And for my hubby, who spends most of his spare time working on his elaborate train set in the winter, I found a great set of small tools, a tiny vice to hold his projects while he's working on them, and a set of lighted, magnifying glasses for a fraction of their regular cost online. He's going to be thrilled. All in all, I've spent considerably less than $200 on everyone/everything, which is absolutely amazing to me. (I've come far, sisters - believe me - thanks to all of YOU!!! God bless you!) Other than baking, which will be done just before the holiday, I am all done. The pressure is off. Now I can concentrate on decorating, writing out cards, and enjoying celebrating the season with the people I love. Pretty awesome stuff! Well, that's all for now. Stay inspired, girls! Stay inspired! :) Daizy! You're a peach! Neat little tidbit girls: Last week I learned that you can actually use your potato water from your HOME CANNED potatoes (not store bought because it contains additives or something) to make your bread! The starch in the water from the potatoes actually enhances the rising action of the yeast (they love it! ), and the bread comes out beautifully risen and yummy. I haven't noticed any type of potato flavor, but the bread is scrumpdillicious! :) Basically, you drain the potatoes, reserving the canning water. Add regular water to increase it to the amount needed for your favorite bread recipe. Super simple! And talk about "using it up" to the last drop! Nothing from your potato jar goes to waste - except perhaps the lid; but even that you can clean up and use for crafts! Think: coasters, Christmas ornaments, pennant swags, etc. With a little bit of colorful scrapbooking paper, some ephemera and embellishments to suit your tastes or holiday, and maybe some felt backing if you're making coasters, you'll have quite a nifty little gift project going on! I do not have time today to read through all of these pages, but you ladies are incredibly inspiring! I WILL be reading all of these, and gleaning from your wisdom! Nini - I LOVE the idea of re-using the canning lids! I am thinking I NEED to try making said ornaments! I have been really upset lately throwing them all away! Nini, Wow! You have accomplished so much. I bet that your Mom absolutely loved the scrapbook, she will treasure it forever. I am not a scrapbooker or card maker but on occasion I do. I look around the home first to see if I have any supplies, ribbons, embellishments, etc. before resorting to spend. I save ribbon and always have since I was a little girl :) Love ribbon! Shannon, thanks for popping by!!! I have learned so much on this thread and hope you do too! I had to look up what a Cinch was. Out here in the west it is something used for horses or a western clothing brand :) I was able to find a binder similar at a thrift store for 3 dollars. I only wish that it would bind with wire instead of the plastic combs.